The National Development Bank is focused on helping local entrepreneurs compete on a level playing field with foreign competition. Through its subsidiary NDB Investment, they are offering commercial spaces for local business men and women to operate and market their products and services. 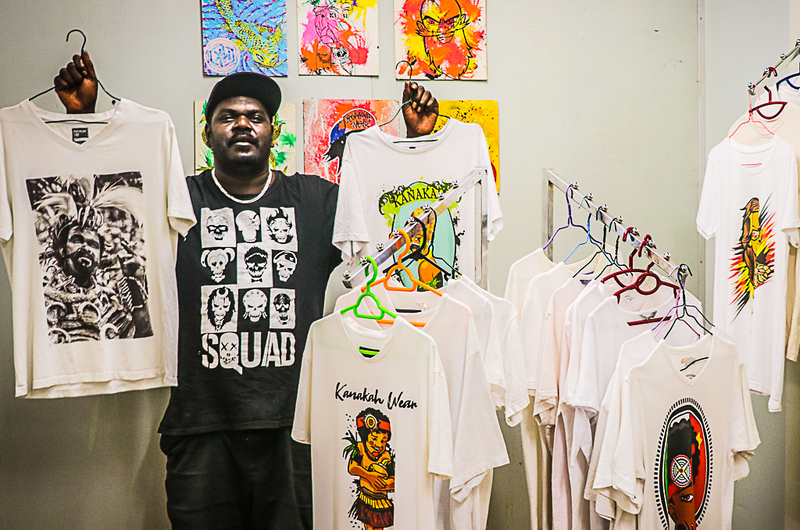 Roderic Tanasu 30, from South Bougainville in the Autonomous Region of Bougainville (otherwise famously known as Blak Bones of the Hip-Hop music group Naka Blood) is one of those many local entrepreneurs that are currently benefiting from the Business Incubation Scheme. “I am an established young entrepreneur that uses my skills in drawing to generate income from it,” he said. Tanasu have qualifications in Internet Technologies from the college of TAFE in Port Moresby as well as the Central University of Queensland in Australia after completing his primary education at Korobosea Primary school and High School at Port Moresby International School. “Because my passion also lies in music, I decided to further my studies in that area so I did Audio Engineering at the SAE institute at Byron Bay in New South Wales, Australia,” he added. A turn of event in 2012 has forced Tanasu to drop his IT career and the passion in music and utilise his drawing skills and employ it as business. “My drawing skill is out of my qualification range. My background is usually in music. So, I went to SAE Institute to become an audio engineer. That’s mixing sound for TV and all those you see in music videos and stuff, like producers in the studio, that’s what I was studying to do,” he said. “But unfortunately in 2012 my father passed away so I decided to come back from Australia,” he added. When he came back, he started to think about what he really wanted to do in his life. That’s when Tanasu started to weigh out his strengths. So Tanasu began looking online and because he had lived in Australia for about seven years, he had friends who were doing this business of direct-to-garment printing and such. He started off in 2017 at the Rainbow Art Gallery during the election time. His business name is KanakaH Wear PNG. “In 2018, I joined Right Image as a sub-contractor and in the start of 2019, I decided to move on my own just to get my own set up,” Tansau said. That is where NDBI came in and assisted him with a commercial space at the SME Central centre at Hohola, Kunai Street where he is currently established and operated in. “I am one of the few local entrepreneurs that are currently doing DTG printing at a very reasonable price of K45 compared to other foreign establishments in the city,” he added. “With the help from NDB Investment and my own advertisements on social media (Facebook), the numbers of interested clients have now increased,” he said. Tanasu does the drawing and sketching himself and is assisted by local graphic artist, Sironen Siling. “I do the drawings and sketches and I am assisted by one of the local graphic artist from Morobe, Sironen Siling who digitizes it and we print them onto 100 % cotton shirts,” he said. Tanasu is now looking at engaging other local graphic artist to help him with the digitizing of his drawings. “This year I’m moving towards collaboration. Just because I want to focus on getting the printing done in the best way I can. So, I am offloading that to other graphic designers. Still the method of me sketching or they feel that they have an idea they want to do, they sell me the artwork,” he added. Tanasu said he was one of the few local entrepreneurs who are now doing that. “We started doing banners now, billboards and other stuff too. We’ve been open for about a month now. Customer range has been picking up a lot. So I do custom shirts at K45 which is pretty cheap. Everywhere else is K75 and above. And I’m doing direct-to-garment printing. That is different from screen printing and heat press and sublimation. Those are the core main printing methods that are used now here in Port Moresby. I don’t think there are other people providing DTG service in Port Moresby right now. DTG is like the image is right onto the garment. You can feel it. It’s printed right onto it. It’s part of the garment. It’s not heat pressed on. The ink actually goes on the shirt. So if customers want to put in bulk orders, the price varies with quantity,” he said. Papua New Guineans are patriotic people. That’s what inspires most of the drawings Roderic Tanasu sketches and then digitizes them and print them onto the shirt. Displayed in the picture are some of his artwork resembling provincial identities including the portrait of the country’s first Prime Minister Grand Chief Sir Michael Somare. .